Microsoft Devices Group yesterday announced what it termed as the “most affordable Internet-ready entry level phone yet”. 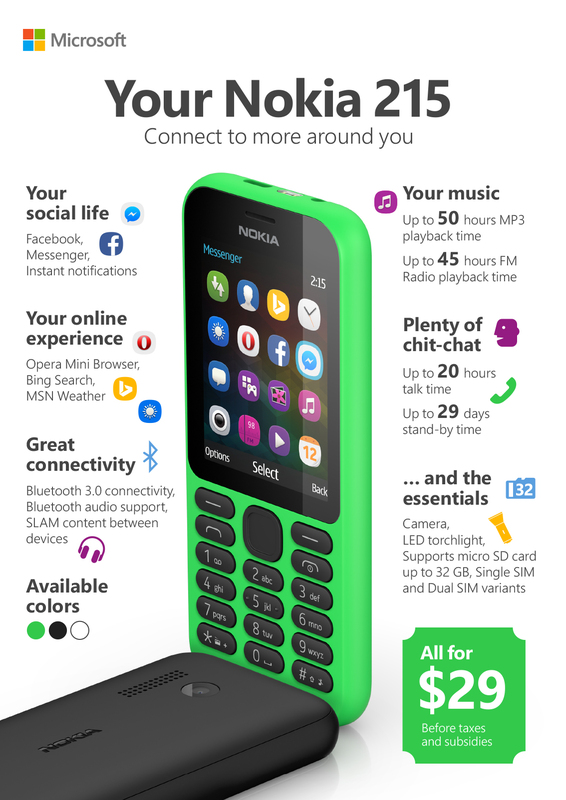 The Nokia 215 priced at $29 is Microsoft’s answer to recapturing the feature phone market that was once dominated by the company it acquired 2 years ago. Microsoft isn’t ditching the iconic “Nokia” brand just yet despite having announced last year that it would replace the Nokia Logo with Microsoft one in all future devices. Apparently the software, services and devices giant licensed the Nokia brand for about 9 years, so it can still use it especially in feature phones where Nokia built a resounding brand in Europe, Middle East and Africa. The Nokia 215 packs a BL-5C 1100 mAh enough to keep you juiced up for almost a month on standby according to Microsoft. The device is only 2G compatible which makes one wonder why and how Microsoft calls it an “internet-ready phone”. On 2G or EDGE, you’ll have access to Facebook, browse the web through Opera Mini and then chat with Facebook Messenger. We can’t stop to wonder why Microsoft never included Whatsapp of all Apps knowing very well that the messaging service has now become synonymous with Mobile messaging. The Nokia 215 is not yet in Uganda or Kenya and therefore the price is not yet determined. However, our sources will update us on the prices as soon as the device comes to East Africa.